The sour German beer style Berliner Weisse is proving rather popular with Aussie brewers these days. First released on a relatively wide scale by Feral in the guise of their Watermelon Warhead, it's been attempted with varying degrees of success by many brewers since. 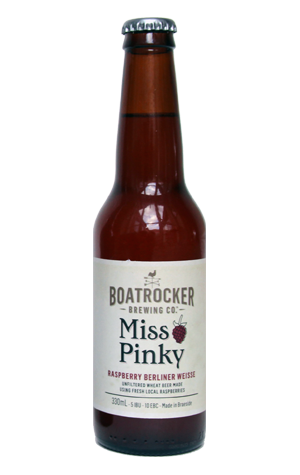 And it looks like Braeside's Boatrocker is making a stab at becoming something of a Berliner Weisse specialist with Miss Pinky becoming its third in March 2015 on the back of the pretty regularly released Mitte and the Orange Sherbet collaboration with To Øl. Initially released as a single batch, keg only release that, like its stablemates, was soured in the kettle with the Lactobacillus bacteria before being re-fermented in the tank with German ale yeast and 100kg of sour raspberries (now more than 250kg per batch as output has increased) that turn it really pink, it's gone on to become brewery favourite. Indeed, the first batch proved so successful that it was brewed again. Then again and again. And little wonder, as not only is it one of the most eye-catching beers you'll see once poured into a glass – a truly vibrant soft pink – but it leads off with a massive raspberry bouquet, is refreshingly tart and offers a touch of barnyard at the denouement. What's more, in 2016, Miss Pinky graduated to the brewery's core range and, as of December, became the first Australian brewed sour beer to be ranged nationally in select Dan Murphy's stores. It had already been spreading its tentacles ever wider and looks set to help lead the charge for such beers in Australia.